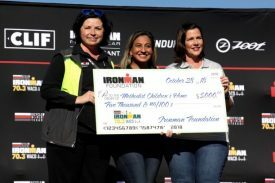 TAMPA, Fla. / WACO, Texas – The IRONMAN Foundation® received a $25,000 donation from Bicycle World Texas in conjunction with the inaugural Bicycle World Texas IRONMAN 70.3® Waco triathlon that was held on October 28, 2018. The funding will support multiple local nonprofit initiatives, including a special $5,000 grant to the Methodist Children’s Home. Methodist Children’s Home was founded in Waco, Texas as an orphanage and today serves more than 5,000 children annually across Texas and New Mexico through residential group care, foster care and other family services. The IRONMAN Foundation grant will be used to support the Methodist Children’s Home track and field team, an activity open to 130 charter school students. The growing program has earned eight state championships through the Texas Christian Athletic Foundation over the last two years. IRONMAN Foundation acting Executive Director Sarah Hartmann presented the grant at the Bicycle World Texas IRONMAN 70.3 Waco triathlon Awards Ceremony in Indian Spring Park following the race, congratulating the participants, thanking athletes, families and fans for their support of the sold out event as well as Bicycle World Texas for their generous support of the IRONMAN Foundation. Hartmann also announced that the IRONMAN Foundation would return in 2019 for a service project, providing athletes, families, partners and staff with a hands-on experience during race week. “The IRONMAN Foundation creates a legacy of service and stewardship in every host city,” said Todd Behringer, Bicycle World CEO and President. “We share the same values of community and family and investing in the next generation of athletes. This donation highlights Bicycle World’s commitment to building thriving sports programs and facilities, expanding competitive sports the whole city can enjoy and support.” Behringer is an avid triathlete having competed in 17 IRONMAN triathlons, including the 2016 IRONMAN World Championship triathlon in Kailua-Kona, Hawai`i. The IRONMAN Foundation Community Fund provides community and volunteerism grant opportunities to non-profit organizations where IRONMAN events are held. In 2018, the IRONMAN Foundation will distribute more than $1.7 million in grant funding to support the needs of race communities around the world. Bicycle World Texas is a premier cycling company with six stores across Texas and has served triathlete needs since 2004. Bicycle World Texas and Waco Running Company are managed by The Behringer Group, LLC, a Waco based business development firm owned by Todd Behringer. Methodist Children’s Home was founded in Waco, TX as an orphanage and today serves more than 5,000 children annually across Texas and New Mexico through residential group care, foster care and other family services. Throughout its history, as the needs of children and families have evolved, MCH has adapted and expanded its services and has become a national leader in childcare. The IRONMAN Foundation® creates positive, tangible change in IRONMAN race communities by engaging athletes and volunteers to participate in programs that demonstrate service through sport and commitment to community. Since 2003, over $50,000,000 has been provided through IRONMAN charitable giveback programs including the IRONMAN Foundation to more than 7,800 local, regional, national and global nonprofit initiatives. Through these partnerships, IRONMAN athletes are powerfully linked to the community and together we leave the IRONMAN legacy behind in our race communities long after event day. For more information on IRONMAN Foundation programs, including Team IMF, Community Fund, Your Journey Your Cause, and Women For Tri, visit www.ironmanfoundation.org.